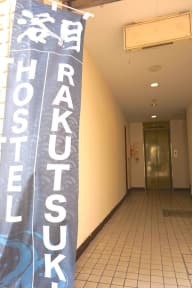 Located in Namba District of Osaka, Hostel Rakutsuki is a 3-minute walk from Nipponbashi Station. Namba Station on Nankai Main Line is a 7-minute walk and Namba Station on Subway Sen-Nichimae Line is a 9-minute stroll from the hostel. All dormitory rooms are air conditioned, and include cozy handmade wooden bunk beds with a bedside lighting, socket and privacy curtain. A shared lounge includes a TV, refrigerator, microwave, coffee machine and a safety box. Free WiFi throughout the property. Shared shower rooms come with free toiletries. Bath towels, toothbrushes and razors are available at an additional charge. 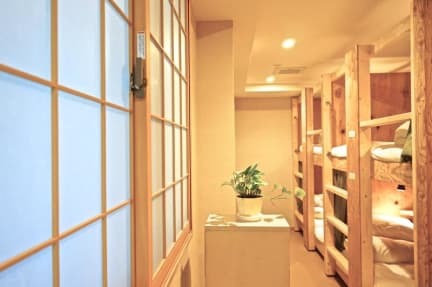 You will find a coin laundry facilities in a female dormitory room. Kuromon Ichiba Market is just a 1-minute walk，Dotonbori is a 10-minute stroll from Hostel Rakutsuki. Glico Man Sign is an 11-minute walk from the hostel, while Tsutenkaku is a 9-minute subway ride from the property. Kansai International Airport can be reached via a 45-minute train ride. Great hostel for the price w VERY friendly staff. Close to bars, restaurants, subway etc. Dorms are big, but beds are placed in such a way that it feels cozy. Clean showers/toilets, washers/dryers available. Spacious dorms with good beds. Wifi on 4th floor(female dorm) wasn't great, it would disappear for hours at a time. Also, there was no kitchen of any kind not even plates or cutlery. Just plastic spoons. Nothing really negative, but worth mentioning.